NAIROBI, Kenya — Just before dawn, I saw him. 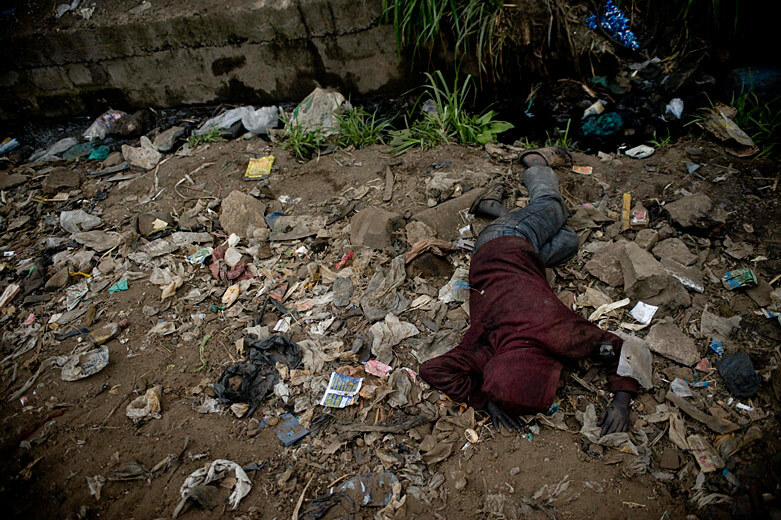 On his hands and knees in a Nairobi side street, the traffic flying past. Trying to stand, he had no strength. He had been crawling, vomiting, his small frame finally collapsing from exhaustion into the sewage and trash. I came here, to Riverside, to learn what it is like to live on the streets of Nairobi, Kenya. About 20 boys live here, all breathing the same putrid air, all daily wading through the sewage of the green, slow-moving Nairobi River. Here, beside the water, the boys sleep, covering themselves with discarded plastic and warming themselves by burning tires. In exchange for dirt beds, they labor for the Nairobi Ministry of Environment by day. The youngest one is 10, the oldest is 18. Some are orphans, some have been abused, some have been kicked out. Some just left home, hearing promises of easy city life and enough food and money to go around. Now they sleep here, on the dirt and filth. They have become brothers, and they take care of one another. But no one is caring for Oscar. He is new on the streets, which means he hasn’t earned his keep yet. Some of the older boys play a game: they throw a rock, and whoever it falls near gets beaten. Oscar has been beaten a lot since he left home seven days ago. As he slept, they tried to throw him into the fire. And now he’s lying in his own vomit. I took the boy to an open-air government clinic. Just picked him up and carried his weak body there. He was silent as we waited in line. In a weak whisper, he told Pastor Fred his story. His name was Oscar. He was ten years old. He had been on the streets only a week. His mother had kicked him out and threatened his life, suspecting him of stealing money from her. As the morning dragged on, and we waited to see the doctor, Oscar came to life. We watched him as he climbed on the brick walls, catching a brown lizard and accidentally snapping its tiny tail in half. He chased a toddler down the length of the courtyard, carrying her giggling in his arms back to her mother. He began playing with my camera, quickly figuring out the controls, and taking pictures of everyone in the clinic, rushing to show me each image. Around noon, he asked to have 10 shillings. I gave him the coin and watched him run off, fearing I wouldn’t see him again. He returned a few minutes later with a paper bag of greasy fries to share with Fred and me. At the end of the day, we asked him if we could take him home. He sat in the front seat and gave me directions to his house. I parked the car, and held his hand as Fred went to talk to his mother. He watched his feet. He cried, making almost no sound. He told me he was scared. We watched in the rear-view mirror as Fred returned, walking with Oscar’s mother and aunt. We walked together in silence to his aunt’s home, where Fred spoke with them in Kiswahili. Oscar did not want to stay, but his mother wouldn’t let him leave. Eventually, we left. And we left Oscar there. On the way home, I had to pull over. I was crying, sobbing hysterically, and Pastor Fred asked me to pull off the road. He put his hand on my shoulder and prayed. He prayed that God would protect Oscar, and that his mother would love her son who had returned. I didn’t stop crying. For the next two days, I cried. And I prayed. Prayed with a desperation I had never felt before. Prayed that Oscar was safe. Prayed he wasn’t on the streets again. Prayed there would be reconciliation and forgiveness in his home. On Sunday, I got in my car and drove to his house. I described him, asked the neighbors if they had seen him. A young woman pointed me toward the church in the middle of town. In the churchyard, several boys were playing soccer. As I stood, looking over the group of boys, Oscar came running to me, and hugged me. He led me by the hand to his aunt’s house, where he told me all about how he was going to stay, how his mother wouldn’t beat him anymore. Oscar held my hand shyly as we drank chai, and when it was time to leave, he wrote his name on the dust of my car. You can help children like Oscar by donating here. Related video and photo galleries at AfricaStories.org.